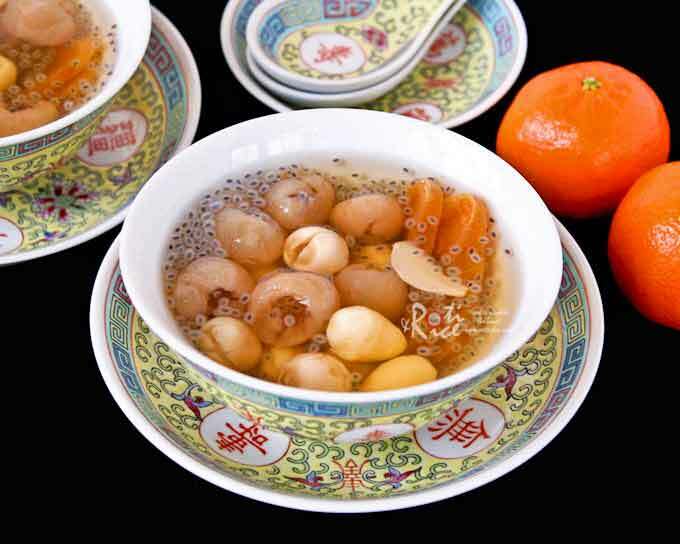 Leng Chee Kang (Sweet Lotus Seed Soup) is a dessert consisting of a variety of pre-cooked ingredients mixed in a syrup. Considered to have “cooling” properties, it may be served warm or cold with ice cubes. Hence, it’s popularity in Malaysia and Singapore where the climate is hot and humid throughout the year. While it is not exactly a Chinese New Year dish, it is a favorite dessert for the many festivals and celebrations observed there. Dried persimmons is one of the key ingredients and since it is in abundance around the Chinese New Year, it makes sense to prepare it now. 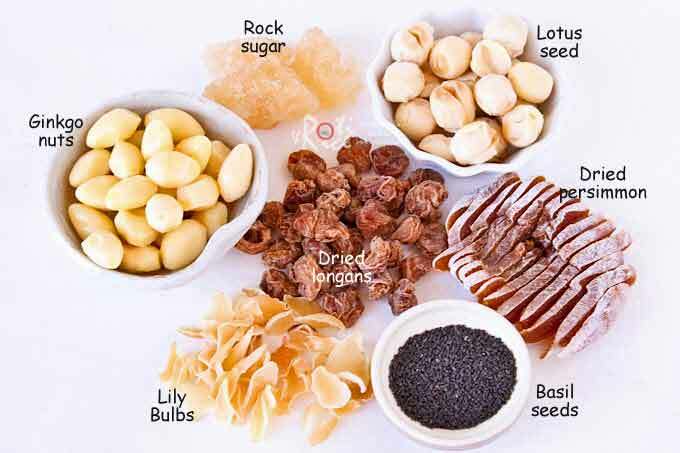 The ingredients for this dessert may vary from place to place but the main ones are lotus seeds, longans, lily bulbs, dried persimmons, and malva nuts. Malva nut a.k.a. pong tai hai (in Hokkien/Fujianese) is a thumb-sized shrivelled looking pod containing seeds that expand into jelly-like fibers when soaked. The Malays called it kembang semangkuk which literally means expand to the size of a bowl. 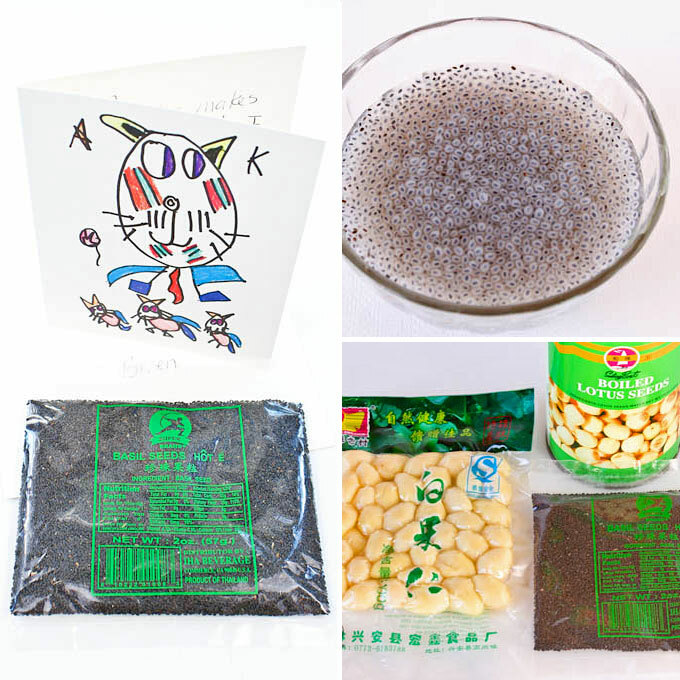 Other creative ingredients in Leng Chee Kang include ginkgo nuts, barley, quail eggs, jelly, and basil seeds. I was really excited when I received the basil seeds as it has been a while since I last tasted them. Leng Chee Kang immediately came to mind and I went about gathering the ingredients. I had no problems finding everything I needed except for two – dried persimmons and malva nuts. I figured that it would be unlikely for me to find malva nuts here in Minnesota and so I had to exclude them. As for the dried persimmons, that shouldn’t be too difficult, right? I looked for them at several stores with no success. It had slipped my mind that persimmons are seasonal fruits and summer is not the right season. I had to temporarily shelve the “project”. Finally, the season has arrived! Dried persimmons are plentiful close to the Chinese New Year in Asia. 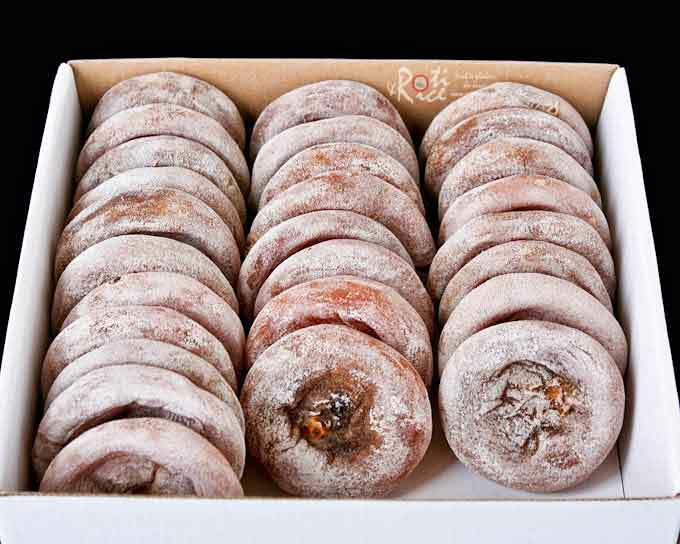 They are not so readily available over here but after some searching, I found this 3-pounds box at the Korean market. And so, with the basil seeds and the rest of the ingredients, I was ready to make this sweet and tasty drink. 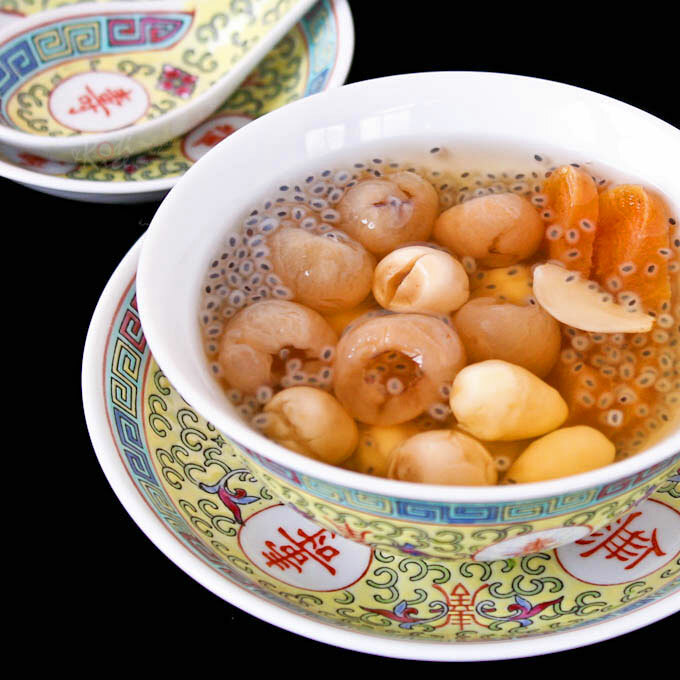 Leng Chee Kang is a cooling sweet lotus seed soup consisting of lotus seed (lean chee) and a variety of other dried fruits. Very refreshing served cold. Rinse and drain lotus seed. Boil in a small saucepan for 2 minutes. Remove and drain. Rinse and soak lily bulbs in water for 30 minutes. Boil in a small saucepan for 15 minutes. Remove, rinse in cold water, and drain. Boil ginkgo nuts in small saucepan over medium heat for 3 minutes. Remove and drain. Using a tea strainer to hold them, rinse the basil seeds under cold running water. Then soak in half cup of cold water until they swell. This should take about 10 minutes. Place all ingredients in bowls separately. Combine water, rock sugar, and dried longan in a medium sized saucepan. Boil over medium low heat for 15 minutes. To serve, place a little of each ingredient in a small bowl. Pour longan syrup over. Serve warm or cold with ice cubes. 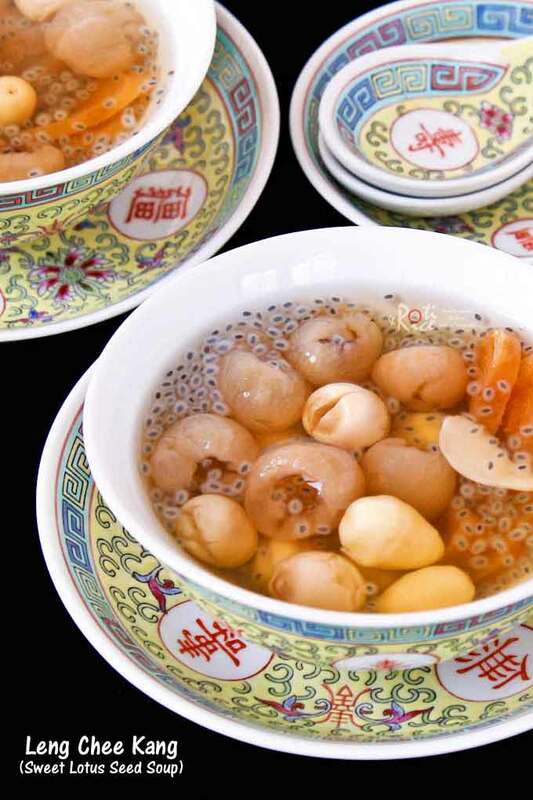 This Leng Chee Kang (Sweet Lotus Seed Soup) was such a treat and well worth the wait! Those persimmons looks so interesting. I have to see if I can find them in our Korean Market…since now is the time to look for them. I wish I was up the with you tasting this drink, it looks so festive! I was happy to send you the seeds, I knew you’d put them to good use. Thanks again Lyndsey for sending me the basil seeds. We really enjoyed this drink and hubby has requested that I make it again soon. Yes, do try and get the dried persimmons soon as they may not be at the stores for very long. Biren – So this is what you made with dried persimmons you showed us the other day. The drink looks beautiful and delicious! I’ll be honest. I’ve not used basil seeds, lotus seeds and lily bulbs. So your photos are very helpful. I learned a lot from you again today. Thanks! This is such an interesting post, Biren. Once again you have introduced me to ingredients I’m not familiar with. I will look for them the next time I’m in my Asian market. wow I miss those dried persimmons! The sweetened soup looks really tasty. What and interesting dessert! It sounds deliciously sweet! Wow, your bowl of LCK is so so good, better than store bought one..and i have never tried this dessert with dried persimmons..and i have never cook basil seeds before, i need to prepare this for my family soon. How pretty! When I was living in Seoul I received a 3-5 lb. box of dried persimmons as well. I wish i had this recipe then because I had no idea what to do with them, and they got rotten. So interesting this dessert, I’ve seen and tasted most of the ingredients but the basil seeds…would love to try this out. This dessert looks exotic and delicious, Biren! Didn’t even know that they are selling dried persimmons. See there is a lot for me to learn and thank you for the education. Have a great week, Biren! You lucky lucky girl, Biren! I would love a bowl of LCK right now. I am positively drooling over my keyboard. I remember sneaking to a food court to eat this on my way to tuition class every Friday evening. It’s so fantastic you managed to find dried persimmons. I am hoping to find them in my chinese shop as there is a high possibility, being so close to CNY. I am definitely keeping this in view to make in the near future. The good thing is I don’t have to fight off ANYONE in my family for this – they don’t like soup!!!! Thank you for sharing! How sweet of Lyndsey…this is a wonderful soup, and I love these flavors! I believe that the basil seeds can be found at United Noodles.